Many years ago I was vegetarian. I’ve returned to meat for some years now (it’s really hard not to eat street meat in Greece! ), but for most of when Marcus and I were dating I was vegetarian. Marcus and I met at university, and since he graduated a year before I did he moved to Calgary (new home for him) about a year before I did (same home for me). It was a big move for him; he was leaving his family and friends for a bit of unknown out west. Marcus had made a couple friends, fell in love with his bike, lived with my parents for a couple months, got a job with the employer he’s still with now, and then moved out on his own with a roommate. I came back home for Thanksgiving that year and checked out the new place of Marcus’, and he made me dinner. 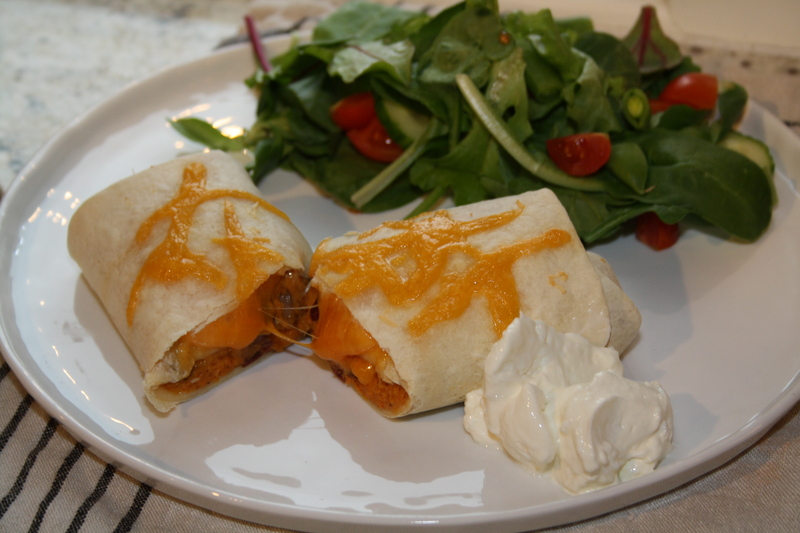 He made me these, these delicious, addictive, totally vegetarian sweet potato burritos. To this day I don’t know how he found the recipe online, but he did, and he made them, and they blew our minds. With the traditional chili spices, they taste, well, chili-esque. The trick is the sweetness of the sweet potato, which balances the cumin and chili powder and cayenne so nicely, especially with the cheesiness and sour cream goodness. Everything is better with sour cream, it’s true. We like this recipe because you can be as bold or mild as you wish. You could certainly add more cayenne, or less spice altogether. Marcus likes to do a half-mash of the kidney beans, but you could mash them all, or none, or somewhere in between like us. And the best part? They freeze wonderfully. We always freeze the leftover burritos, and take them out to thaw the night before. They make a wonderful work lunch. 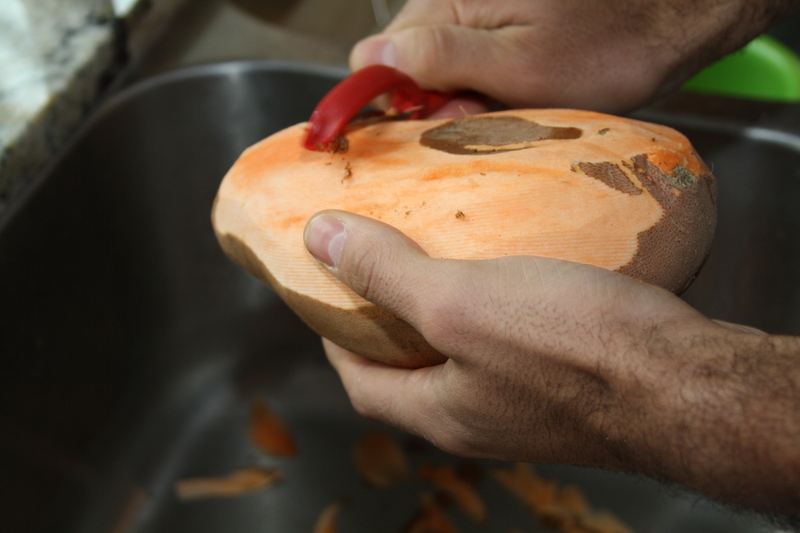 The sweet potato-bean mixture itself also freezes well. If you find yourself with too much filling and not enough tortilla, put the filling in a freezer friendly container and pop in the freezer. For any easy meal, thaw the filling, and then start your assembly before baking. While I do most of the cooking (and all of the baking) in our little household, it’s really because I just take things over and not because Marcus can’t cook. In fact it’s the opposite: Marcus is a really great cook, and because of that, he’ll pop up now and again on in the kitchen with… He has certain meals that he makes, sweet potato burritos included. Marcus makes wicked pancakes and french toast, pulled pork and pineapple ribs. And the more I think about it, we seem to just really like things Pippy likes. 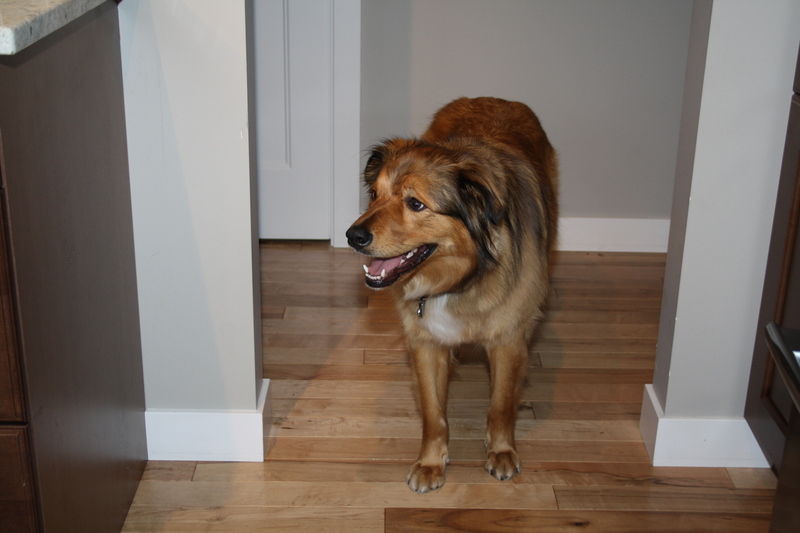 You may say we have the same taste as a puppy, but that sweet boy goes crazy for sweet potato! We buy dried sweet potatoes as a treat for Pip, and it’s even more of a treat when he gets a little chunk of the cooked and cooled sweet potato. A small amount is good for a pup’s tummy too. It’s fun for me to be in the kitchen with Marcus. He may feel differently – I may have tried to insert myself in his cooking business once or twice – so I think my role shall remain supervising from the kitchen table with a glass of wine in hand. 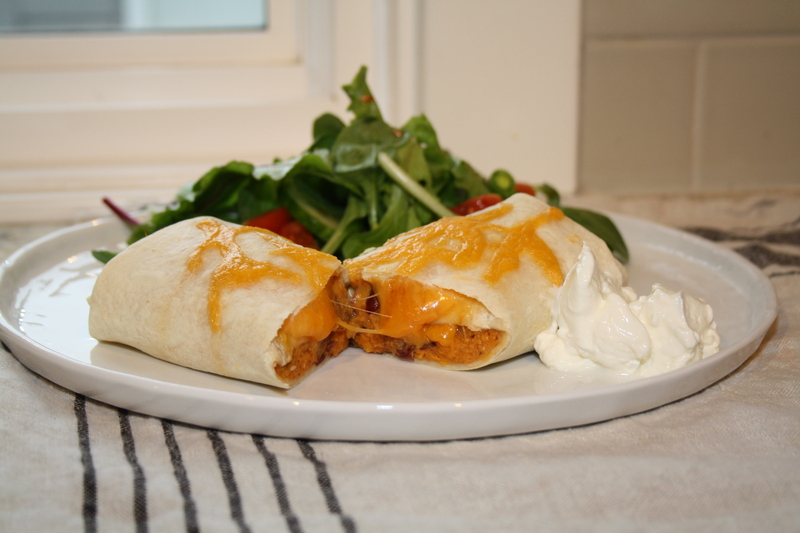 Sweet potato burritos are easy and filling, and perfect for a weeknight meal. They could easily be made vegan. And they pair with a simple salad beautifully. They’re requested often and loved always. In a medium-large skillet, heat the olive oil over medium heat. 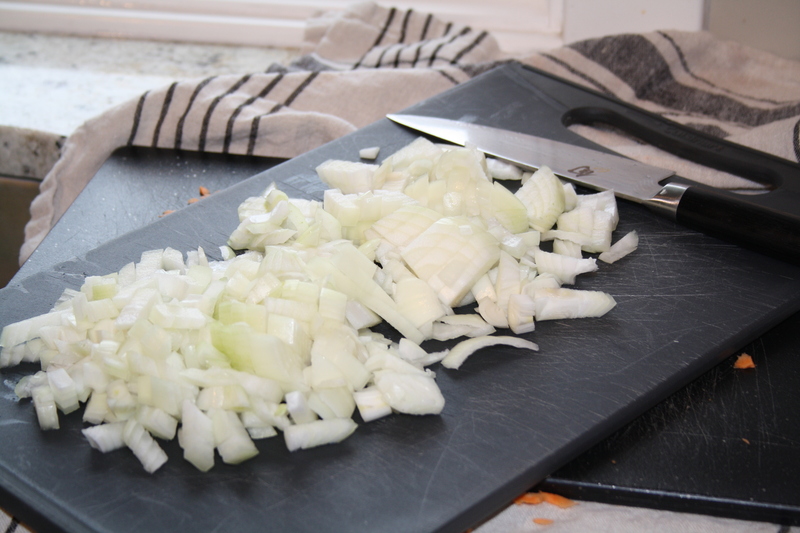 Add the onion and garlic and saute until soft and the onion becomes opaque. 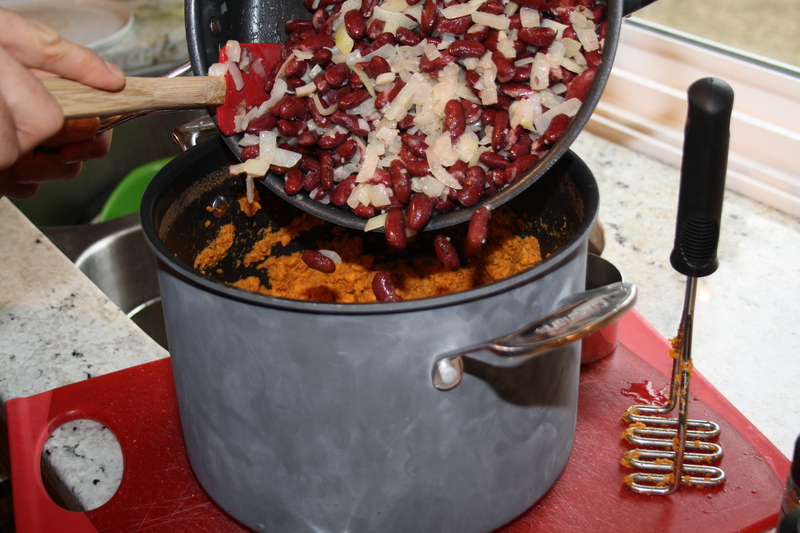 Stir in the kidney beans and with the back of a wooden spoon break up about half of the beans so it becomes a slight mash. Take off the heat. 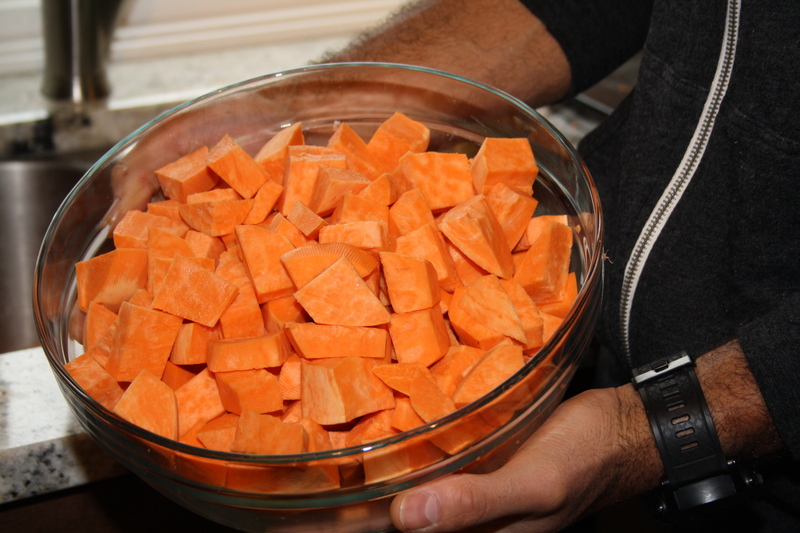 In a large bowl (or the pot you cooked/mashed your sweet potatoes in), add the soy sauce, chili powder, mustard, cumin, and cayenne to the mashed sweet potatoes, and stir together well. 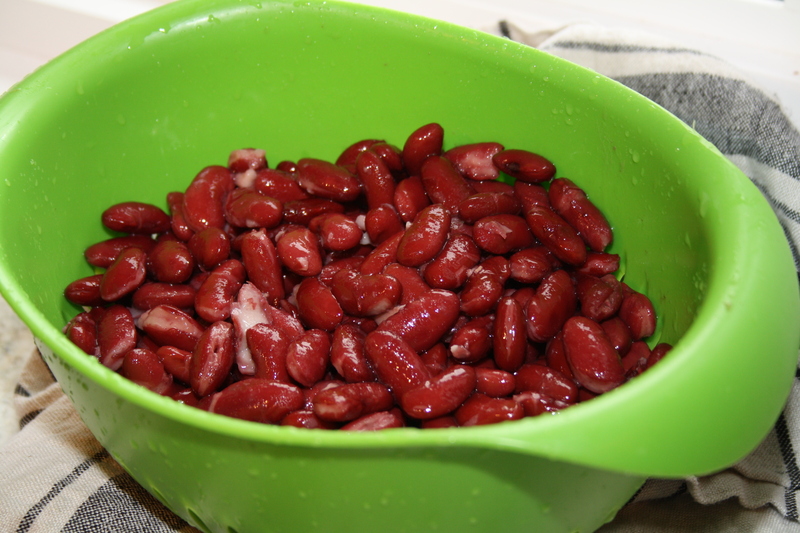 Toss in the kidney bean-onion mixture and stir together. Give the mixture a taste and adjust the seasoning as needed. 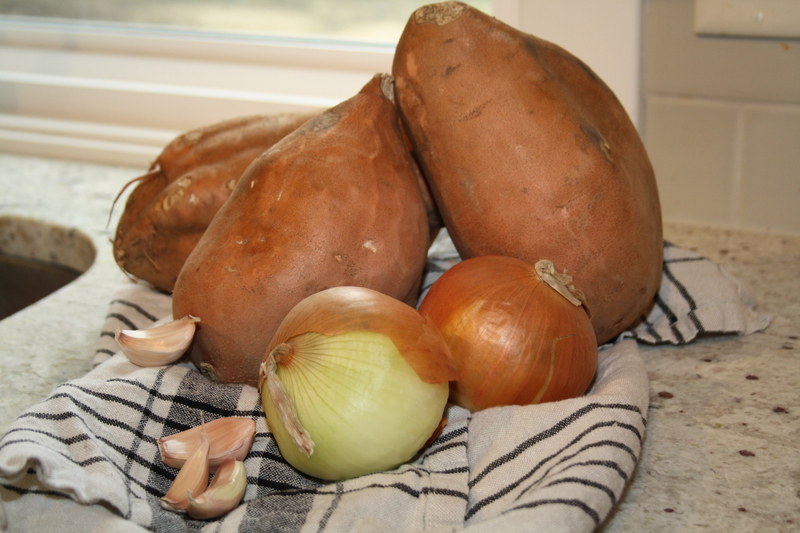 Prepare your burritos: add about 1/3 cup of the sweet potato mixture to each tortilla, give or take a couple tablespoons depending on the size of your tortillas. 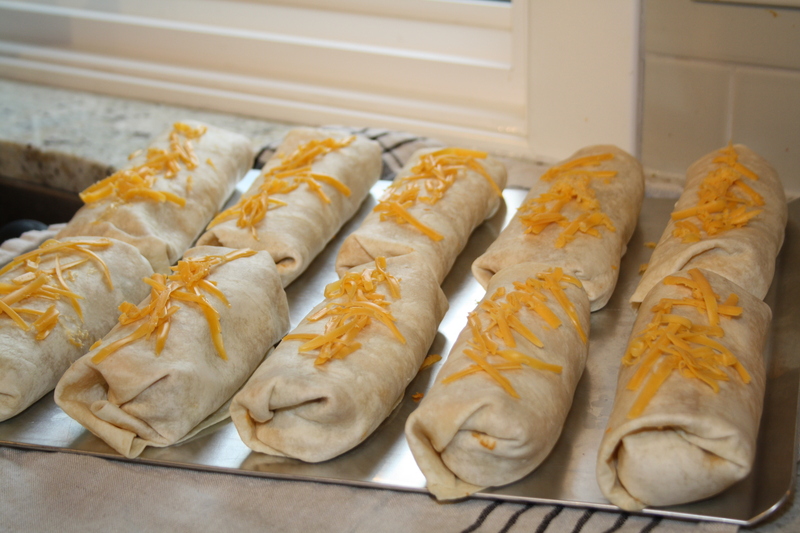 Top with cheese, then fold burrito-style. Line a baking sheet with foil and arrange the burritos on the sheet. 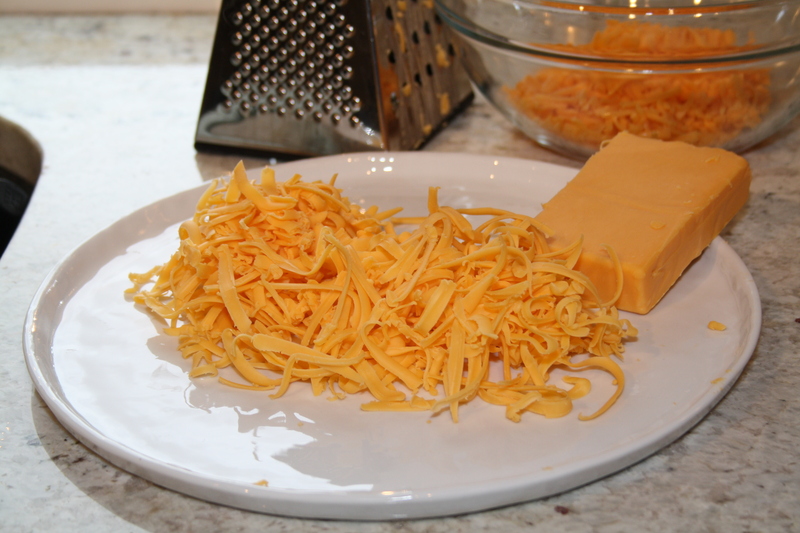 You can top with more cheese if you so desire. Bake for about 15 minutes, until the burritos are warmed through and the tortilla becomes just golden. Serve with sour cream and salsa.